The county released the announcement on sewer capacity in a meeting of the county’s Development Review Committee, which was considering the Preliminary Site Plan and Site Development Plans for the new auto dealership. The DRC approved the Preliminary Site Plan, but Sandy Weinel, assistant director of the Planning and Code Enforcement Department, told a representative of Mercedes-Benz the firm will have to build a private septic system if it wants to move forward before sewer capacity is available. The Development Review Committee also reviewed revised Site Development Plans for a Burger King restaurant on Hog Mountain Road across from Oconee Elementary School. The only question raised was about striping on Hog Mountain Road at the entrance to the drive-through restaurant, and no resolution was reached on that issue. Weinel, who chaired the DRC meeting, raised the problem of sewer services at the beginning of the discussion of the Mercedes-Benz plans. “The biggest issue for this project right now is that there is no sewer capacity available,” Weinel told Jason Stough, of On Site Civil Group of Milton, representing Mercedes-Benz at the meeting. “There is a 12- to 18-month delay,” she added. Weinel gave Stough a copy of a Memorandum dated March 21 from Utility Department Director Wayne Haynie to herself and B.R. White, director of the Planning and Code Enforcement Department. The Calls Creek plant is being expanded, and additional capacity should become available in 12 to 18 months, Haynie’s memorandum states. Some of the current flow to the LAS will be diverted to the Calls Creek plant, and “some limited commercial and industrial capacity” will become available at the LAS sometime in the middle of 2018, Haynie wrote. If the project is in the LAS service area, “we may defer on the letter or, if requested, issue a letter stating that capacity does not current exist,” according to the memorandum. In June of last year, the Board of Commissioners approved a rezone request for nearly 30 acres on SR 316 at Virgil Langford Road for a proposed cluster of auto dealerships and related businesses. Mercedes-Benz was identified as a potential tenant, and county tax records show that TT of Athens Inc., owner of the Mercedes-Benz dealership and a West Palm Beach, Fla., auto business, purchased the property in July of 2016. The Preliminary Site Plan approved by the DRC was for 8.3 acres and shows a 360,431-square-foot-building fronting on SR 316. The dealership will be accessible off Jimmy Daniell Road. Stough of On Site Civil told the DRC that it would take about 18 months to finish work on the Mercedes-Benz dealership so the delay might not be a problem. The project could be delayed a year to accommodate the lack of sewer, he said. In the initial rezone proposal, Williams and Associates, the land planning firm representing the dealership, had estimated that the entire complex would require 7,940 gallons per day of sewer capacity. Haynie had not made a firm commitment indicating that capacity would be available. 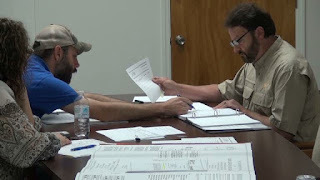 It consists of representatives of the Planning and Code Enforcement Department, the Public Works Department, the Environmental Health Department, the Utility Department, and the Emergency Management and Fire Department. The meeting today took place in the conference room of the Government Annex on SR 15 on the south of Watkinsville. The discussion of the Mercedes-Benz plans was the first item on the agenda. The discussion of the Burger King was the last item on the agenda and begins at 19:30. OCO: DRC 4 21 2017 from Lee Becker on Vimeo. Oconee county is getting uglier by day. The county is on the fast track to become Gwinnett because of gratuitous development. In another couple of years you wont be able to tell them apart. The land use plan is a complete joke. The county has never followed it and it shows. May want to review land use plan first. Probably should have closed the gate right before you arrived. Before the explosion of sewer capacity, building and development relied on septic and the county grew at a moderate rate that did not overly tax the existing infrastructure of the day :ie schools, police, roads, parks and rec. library etc. etc. Maybe we need to rethink and incorporate septic into new development. Unless your family has been here since the 1800's, your opinion doesnt matter nor do you. Just seems you were not bothered by land use map that allows you to artive. 1900 people were just fine. And actually developed a very good map, build a great education system and everything else that brought you here. Once here, every thing is awful the plans are awful. Read the map, it is being followed. Map is under review now. Don't like it the n try to change. Lay off your broad generalization lacking facts. Unfortunately, Mr. Davis left us in a stinky mess. Infrastructure is needed to support development. Infrastructure requires $$. Land use plans work if followed. We have pretty knowledgeable staff employees. We have some interested concerned citizens (but not enough when items don't affect them). Hopefully the citizen advisory committee will have some useful input. At least most of the current commissioners are interested in looking out for the future of the county, but it won't be easy for them. Every citizen, no matter how long they have lived here, desire an equal say in what happens (one person, one vote). I didnt move here, I'm 6th generation. Can you say the same? Why is the lad use maps not enforceable? WHAT IN THE HECK??!! A Burger King and another fast food place directly across from the entrance to the three schools? This is insane! Who approved this? Was the Board of Ed and sheriff included in this discussion? It is going to be CRAZY in that area every school day. Have you ever seen how many cars are there for big PTA event nights? How many fast food places do we need? There's a Subway, McDonald's, Zaxby's & Dairy Queen right there, plus Your Pie, La Parilla, Dominick's, the BBQ place, two Asian food places, and a cafe at Publix. How many places to eat does Oconee need in a few block radius? Who in their right mind thought this was a good idea? And who is this Ken Beall guy? More fast food places; thanks Mr. Beall. I cannot believe the county commissioners approved this. Just change the name of our county to Gwinnett East. Very disappointed. A sell out with a capital "S". Ken Beall is a land planner. The BOC vote was in July of 2016. There is a link to that story in the post, just above the last section. Put the curser on "voted in July" and click for the link.